As you continue in this study I pray that you are becoming more like the wise builder (6:46-49). His foundations were strong and could not be shaken because he does not only hear God's word he practices it, he lives it. 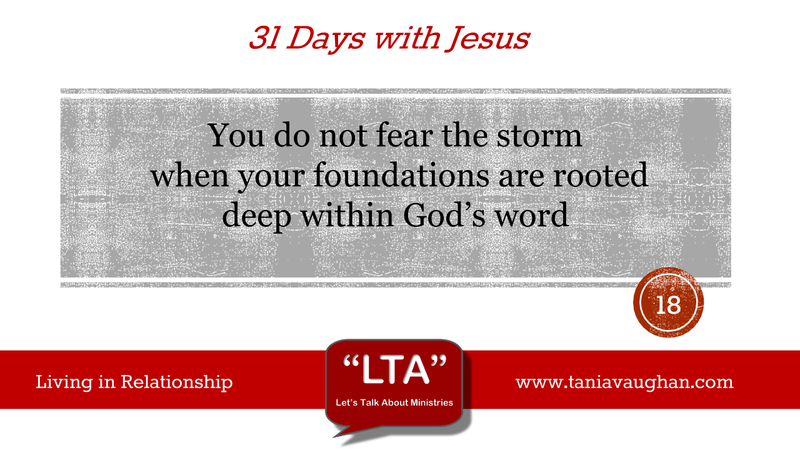 The strength and foundation that knowing God's word gives us is clearly demonstrated by Jesus in the desert. As the devil tempts him with deceit and lies, Jesus counters with the word of God. Twice he says "It is written" and then "it says". He uses old testament verses, God's word that Jesus knew, studied and lived by. Jesus was hungry and the devil taunted him with a solution to get bread. In the western world many of us are not familiar with that kind of bodily hunger, we hunger instead for things in life. The enemy whispers that we need the latest, the best, more money, temporary joys and pleasures, there is so much temptation around us that we're told we need. The verse Jesus quotes in rebuking the enemy is Deuteronomy 8:3, but it is only half of it, we do not live on bread alone, we live on God's word which fights temptation and fills our need. Jesus' relationship was so strong with God that it sustained him, there was nothing he needed more than God's word and presence. He models the relationship we are to have with God through our relationship with him. What is tempting you away from God's presence, his word and living it? What has become a bit of an idol? TV, gaming, shopping, Facebook, the list goes on. Anything that takes priority over God can become an idol and we are to serve him only no matter what else is on offer. Jesus was offered the kingdoms of the world, but it meant worshipping the enemy. God is jealous for you, he wants you in a deep relationship and focused on him, as he is focused on you. Knowing God's word is not enough, the foolish builder knew God's word but did not live it. Even the devil knows God's word and will use it against us as he did against Jesus. He quotes from the Psalms trying to use Old Testament verses as Jesus was. The word can be used against you and if you do not know God in relationship, as a person, it is easy to take verses out of context. Psalm 91 is a promise of love and protection, but that doesn't mean you can purposefully put yourself in harms way to test it. It is your faith and trust in God that assures you of that truth. You can protect yourself from the enemy with God's word and Jesus' name but he is always waiting in the wings notice that the devil left Jesus until an opportune time. He continually prowls looking for a weakness. Knowing God's word strengthens your foundations and knowing God strengthens your relationship. These two things are bound together through the presence of the Holy Spirit living in you. When Jesus enters the desert he is filled with Holy Spirit and after he leaves he returns to Galilee in the power of the Holy Spirit. He did not face the enemy alone and neither do you. How does Jesus keep his strength up, the power of the Holy spirit flowing and his relationship with God fresh? He prays (5:16) alone and intentionally and persistently throughout the night (6:12). I've previously written about these two verses and you may find these posts helpful if you struggle with prayer. Are you too busy to pray? and Being persistent in prayer. As you continue in God's word call on the presence of the Holy Spirit to make it alive to you, pray about what you are reading and listen for God's voice. Lord, I thank you that your word protects me, that in knowing it I can know you more. Help me to not only read but live what you are showing me. Make your words alive by the power of your Holy Spirit. Lord, as I follow Jesus' example I want to know him more and strengthen that relationship so that I am better protected from the prowling enemy. Here we are talking about foundations again! Funny how that is so important in building a strong relationship - think of the strongest relationship you have in your life - parent, friend, neighbour. Imagine how strong that relationship would be if you did not invest time and effort into that relationship. If we do not put the time in we can't expect the relationship to be strong. But I think the interesting point you make here is that of idolatry. The enemy is very cunning in how he erodes away at our relationship with JC - as long as we are not in God's presence the enemy wins; does not matter what we are doing so long as it’s not investing in JC! That's not to say you need to be in his presence 24/7 but if there is something you value over JC then you have issue. It might be football - watching it, playing it, talking about it, even traveling to it. When you go to football instead of church, or stop going to house-group to watch games - the devil wins. I'm reminded of 2 things. 1) Eric Liddell Scottish Athlete and Missionary - After refusing to run in the heats on a Sunday, for his favoured distance, men's 100 metres, Eric Liddell could still compete in the men's 400 metres at the 1924 Summer Olympics in Paris, which he won. Liddell's Olympic training and racing, and the religious convictions that influenced him, are depicted in the Oscar-winning 1981 film Chariots of Fire and 2) Due to the great worship at Soul Survivor church people started to come to church for the worship and not for God. People were worshiping the worship leaders. Controversially the worship was suspended until the Pastor heard from God that it was right to resume. This led to the song lyrics ‘When the music fades and all is stripped away and I simply come. Longing just to bring something that's of worth that will bless Your heart. With the chorus I'm coming back to the heart of worship and it's all about You, it's all about You, Jesus. I'm sorry, Lord, for the thing I've made it when it's all about You, it's all about You, Jesus. We all have things we love but are they distracting us from investing in our relationship with JC?